This is actually a vegetarian recipe, though is obviously easily adapted to use 'proper' sausages if you'd prefer. I wanted to make the meal a little healthier so used Quorn sausages instead. 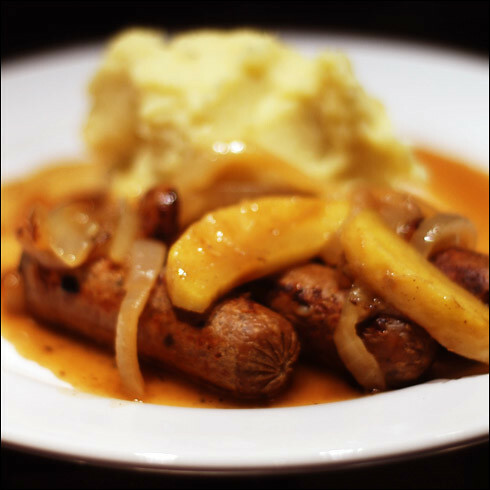 Either way, bangers and mash is glorious comfort food and it's still cold enough to get maximum enjoyment out of it. I love adding apples to the gravy as I think it makes a delicious combination. However, if you're not so keen feel free to leave them out. Peel the potatoes, cut into chunks and then put into a pan filled with salted water and boil for about 20 minutes or so, until soft. While the potatoes are cooking, thinly slice the onion and fry with the sausages in a pan (use a little oil if using vegetarian sausages here). Peel and decore the apple and cut into 5mm slices, and add to the pan. Cook until the onions are soft and caramelised, then remove the sausages and place in a warm oven. Add a tablespoon of plain flour to the onions and apples and cook for a minute, then, stirring constantly, gradually add the stock until you have a reasonably thick sauce. Add the wine (and Worcestershire sauce if you're not vegetarian) and reduce for 2-3 minutes. Finally, drain and mash the potatoes, then add the olive oil, mustard and skimmed milk and beat until smooth. Taste and season with salt and pepper as desired. Remove the sausages from the oven and place on plates. Add a dollop of mash and spoon over the gravy. I find this especially good served with white cabbage slow-fried with lemon juice, cumin and coriander, but I know this isn't to everyone's taste. Enjoy every bite! I've been looking for recipes where I can use my red wines, since there aren't a lot of wine drinkers in my family. Thanks for sharing this simple recipe.